Surabaya, 13 September 2018 – Visit Surabaya, Astragraphia Document Solution do a market update and also reintroduces the Iridesse™ machine and launches the latest monochrome production machine from Fuji Xerox, Fuji Xerox B9100. This event took place at the Shangri-La Hotel, Surabaya. The event was attended by Graphic Art players from Surabaya and Eastern Indonesia. Iridesse™ Production Press is a high-end printer for professionals. Iridesse™ production machine is claimed to be very suitable for creative business people because it is the only printer machine that has the ability to print six colors, including special colors such as metallic with a single pass method, using additional up to two dry ink specials in Gold, Silver, Clear, and White with captivating print quality. 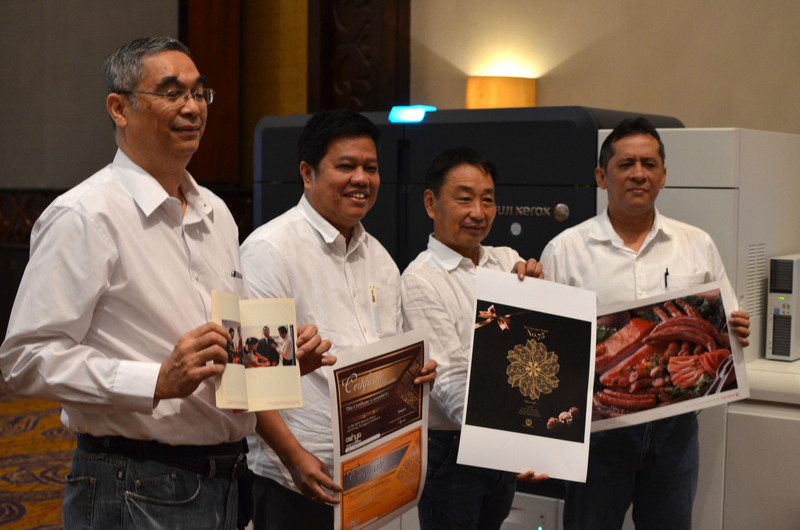 By introducing Iridesse™ Production Press in Surabaya dan Eastern Indonesia, Astragraphia shows its commitment to strengthens the printing and creative industry. According to the Ministry of Industry, nationally the printing industry has experienced growth of 24,42%. This is the right momentum for Astragraphia to introduce its superior production machines nationally. "As a leader in document solutions, Astragraphia through Fuji Xerox Iridesse ™ production press and monochrome production machines, Fuji Xerox B9100 makes efforts to contribute to the ecosystem of the printing industry and creative industries in Surabaya and Eastern Indonesia. Using cutting edge technology, we ensure that the innovations that we present can drive the development in this industry as a whole, starting from the graphics business owner to the consumer. " said Mangara Pangaribuan, Director of PT Astra Graphia Tbk. The diverse background of consumer needs makes consumers must be able to adjust the use of printing techniques and the tools of the printing machines. Not only relying on conventional offset printing that can produce high-volume works, most businesses now choose on-demand printing, with a shorter time to complete a number of catalogs, manuals, and advertising materials. Offset printing requires time and costs for making plates, adjusting colors, and proofreading, while digital printing can process jobs with shorter time and costs and added value on printed material. Increasing the value of printed products through the use of their capital equipment such as digital printers is very important for printing companies to grow their businesses. The intellectual asset of the University in the form of scientific papers is the thing that must be conveyed to the readers starting from the scope of educational institutions to the community directly. The Document Solution for on demand print with a concept print anywhere, anytime, and cashless transaction.